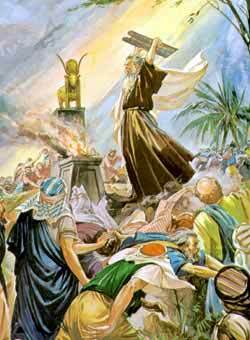 After returning from Mount Sanai, Moses was angry when he saw the golden calf. WHILE THE CHILDRENof Israel were encamped in the wilderness, Moses’ wife and his two sons, together with Jethro, his father-in-law, came to him there. And Jethro, seeing how Moses was overburdened with the care of so many people, advised him to appoint officers over them, under himself, who might attend to all their smaller concerns. But God Himself had the chief government of the people; and on Mount Sinai, where Moses spoke to Him and saw His great glory, He gave to them, not only the Ten Commandments, but many other laws and directions, for all they should do in worshiping Him. That was an awful sight when God spoke to Moses on Sinai! For there were thunders, and lightnings, and a thick cloud, like the smoke of a furnace, about the mountain; and from out of it came a great voice of a trumpet, sounding louder and louder: and then Moses went up and spoke with the Lord God. Moses was forty days in the mount, and the people began to wonder what had become of him. So they asked Aaron to make them some images which they might worship, and that might guide them out of the wilderness. Aaron knew there was only one God, yet he did as the people desired. He bade them bring their golden ornaments to him; and then he melted them, shaped the metal into the form of a calf (one of the false gods of the Egyptians), built an altar before it, on which the people might lay their offerings, and told them that was their god that had brought them out of the land of Egypt. The next day the people offered sacrifice to this calf, just as the heathen, who did not know God, worshiped their idols, or false gods. But God saw this; and He was so displeased at their wickedness that He would have destroyed them all, had not Moses interceded for them. Then Moses came down from the mount to the camp, and asked Aaron how it was that he and the people had committed so great a sin. Aaron tried to excuse himself by laying the blame on the unruly Israelites. But there was no excuse for him. And after Moses had burned the calf, he ground it to a powder, and threw it into the water that supplied the camp. God also, though he had granted Moses’ prayer, commanded that great numbers of the people should be put to death for their sin. This entry was posted in Discipleship and tagged Aaron, Egypt, God, Golden calf, Israelite, Jethro, Moses, Ten Commandments, theology. Bookmark the permalink.